In this guitar lesson, you’ll learn how to play over a simple Em, C, A chord progression. This style of lead is similar to something you might hear T-Bone Burnett or Bill Frisell play and takes advantage of the tremolo (whammy bar) on your guitar. If you don’t have a tremolo, you can still play the notes taught in this lesson. Nothing I’d play around the campfire, but I’m certainly going to add this to my repertoire. I don’t ever use a tremelow/whammy bar and I have none on my SG anyhow, but I’m sure it’s still gonna sound cool without it. I know what you mean, I have 2 Pauls and a non whammy Strat. Good excuse to buy another guitar? IMHO, there’s something magical, psychedelic and nostalgic about that space cowboy kind of 60s style. I really like this too. Brian’s remarks about how important it is to stretch out of our comfort zone seem totally right. I think this is a very interesting exercise in extending the expressiveness of our playing, including fairly subtle use of a tremolo arm, but I just love the sound of a Strat with tremolo and delay anyway. 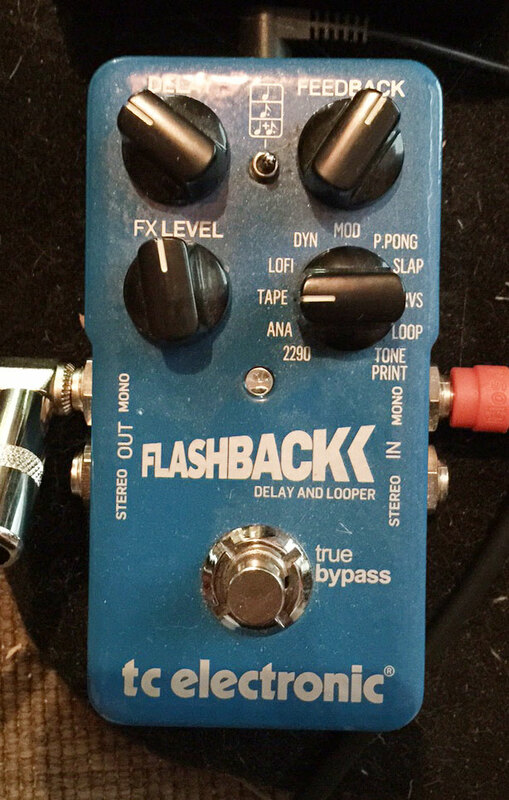 Good idea too to show a picture of the Flashback pedal settings. I agree with Brian Belsey it is an interesting exercise, and one that gets you out of a possible rut and into a whole different way of playing etc..
All Brians lessons aren’t going to suit everyone as they are very varied but at the same time they give you a whole and rounded way of playing rather than just one style all the time. Good information on the use of the tremolo bar and the delay pedal.&nbsp; Agree the picture of the delay pedal is helpful.&nbsp; Thanks Brian. sounds lydian to me does anyone agree. Can’t wait to work on this. Very Twin Peaks sounding. Bet David Lynch would love it! Thanks for offering up something different! Reminds me of a soundtrack of a Dennis Hopper film. The David Lynch is spot on. I’ve been perusing guitar teaching sites for years and this is by far the best I’ve ever seen. Thanks Brian for pushing me to stretch the envelope! Na, does nothing for me this time. Very Floyd Brian I thought was great sparse yet very melodic you need lessons that test your playing that’s how you improve as a guitarist. I grew up with surf and space instrumentals. Reminds me of The Ventures in Space cd with a bit of Hank B Marvin thrown in. I think Chris Izaak fans might enjoy this. A welcome change up! Brian, I was very happy on this occasion to explore the possibilities my Digital Amp (Spider 6 Line IV 75) has to offer and , in the process, learn how to create different moods using additional tremolo technique. I have always been attracted to Pink Floyd style and this lesson has given me some insight on how to start playing as David doesI. It is very important that you do continue stretching us,. By any means, do keep on using Blues as foundation but allow us to explore, at times, new styles. Overall, I give you full mark on your thinking and how you continue to construct your lessons.